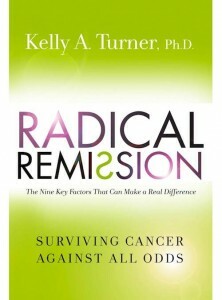 Radical Remission is a book by Kelly Turner, Ph.D. She is a scientist and a researcher and a generally outrageous, beautiful and brilliant woman. I had the good fortune of meeting her at a the Annie Appleseed Project annual cancer conference where we were both speaking. Kelly studied people diagnosed with cancer who actively engaged in their own healing processes, forging their own paths to health and wholeness. She discovered that there are nine qualities that all of these people had in common. Read this book. It will change your life, whether or not you have been diagnosed with cancer. It is about creating lives that not only promote health and wholeness, but lives of meaning and authenticity, lives that are filled with genuine happiness and inner peace. Build Your Foundation for Health. Start with the Five Daily Essentials.